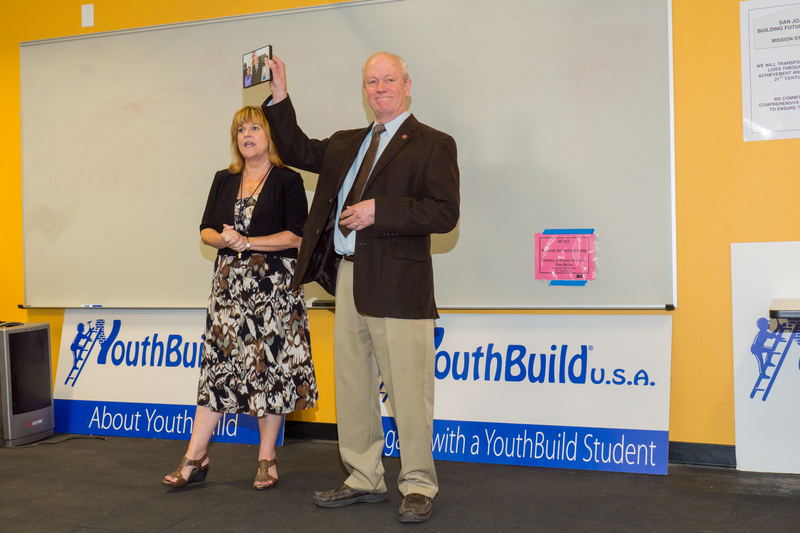 On August 26, 2014, Congressman Jerry McNerney, a staunch supporter of YouthBuild, visited Building Futures Academy/YouthBuild, located in Stockton, CA. After touring the community garden and student parking lot, new additions to the campus since his visit last year, he addressed the nearly 130 students on campus. He spoke words of encouragement, stressing the importance of staying in school, sticking with the program and taking advantage of every opportunity that is available. When asked why he supports YouthBuild, the Congressman responded that YouthBuild is a program that meets the needs of the communities, it is successful, and has the data to prove that it works. He fielded tough questions regarding Stockton’s bankruptcy, corruption in politics, and what he is personally doing to improve our local economy. The Congressmen urged all students to join him in community service projects, explaining the intrinsic values that one experiences when giving back to the community. He concluded his discussion by stating that he will always write a letter of support for any grant that we write to improve our school and program. The staff and students thanked him for his continued support by presenting him with a framed photograph of the YouthBuild students that visited his DC office last April during YouthBuild USA’s Council of Young Leaders.